A range-restricted species (EOO 716 km²), known from four subpopulations, but not threatened. Little Karoo between Laingsburg, Ladismith and Barrydale. Steep, rocky, dry north-facing lower slopes at the transition between fynbos and succulent karoo. 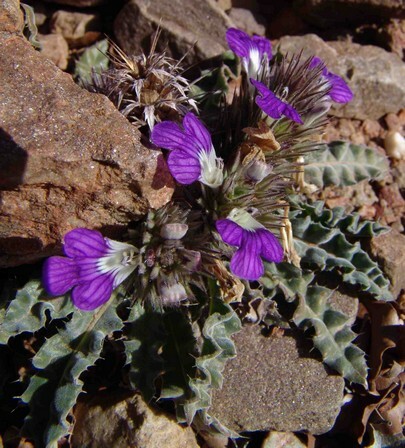 The area where this species occurs is severely overgrazed in places, however the type collection (Boucher 1560) notes that it is abundant on dry rocky overgrazed foothills. It appears to be a pioneer species thriving under conditions of disturbance, and the plant itself is not grazed (J.H. Vlok pers. obs. ), and therefore it is unlikely to be threatened by overgrazing. 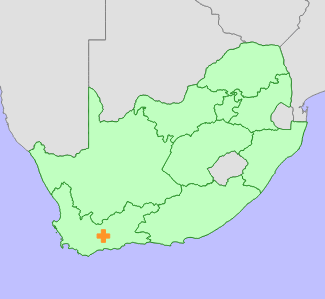 This species has a restricted range, and is currently known from four subpopulations, southern foothills of Anysberg, Wittepoort between Anysberg and the Klein Swartberg, the northern foothills of the Touwsberg, and the north-eastern base of the Warmwatersberg near Barrydale. Vlok and Schutte-Vlok (2010) describe the species as abundant. Steyn, H.M. and Van Wyk, A.E. 2015. Taxonomic notes on the Acanthopsis disperma-hoffmannseggiana complex (Acanthaceae, tribe Acantheae), with an interim key to members of the genus. Phytotaxa 219(1):1-26.